Conset 501-27 Electric Bases - Limited Time Sale on several models while supplies last. Ergonomic Product Cameos Page Updated! For more information on this keyboard, see the our online catalog. 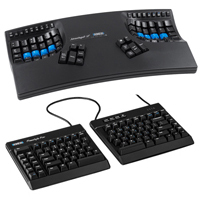 Kinesis is now offering the new Cherry “Quiet” MX Red Linear Feel switch as a new model of their Advantage2 Keyboard. The Advantage2 LFQ (KB600LFQ) will be replacing the standard MX Red version (KB600LF). The Cherry MX “Quiet” linear feel, low-force switch has the same force properties as the standard Cherry MX Red but incorporates a patented noise reduction feature making the switch noticeably quieter than the “clackety” sound of the MX Brown switch. The MX “Quiet” Red is an ideal choice in open work environments where ambient noise is a concern. There is a consistent force throughout the full stroke of the key so there is no tactile feedback unless the switch bottoms out. Many gamers and heavy typists prefer the Cherry Red’s due to their “smoother” feel. Since there is no “peak” or tactile force, the total effort required to reach the activation force of 45 gm is slightly less than with the tactile (brown stem) switch. These "Quiet" switches have also been available on the Freestyle Pro (KB900-RDQ) for several months. 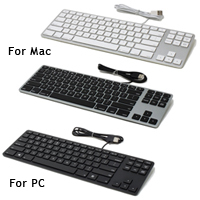 For more information on either of these keyboards, see the our online catalog. 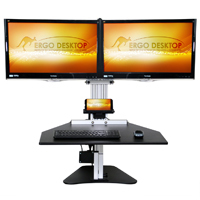 For more information on the Electric Kangaroo Elite, see the Sit-Stand/Lean - Retrofit - Freestanding product line page in our online catalog. 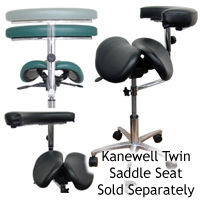 For more information on the Kanewell 360 Arm Accessory, see the Sit-Stand / Lean - Seating product line page in our online catalog.